Is it big enough to keep? 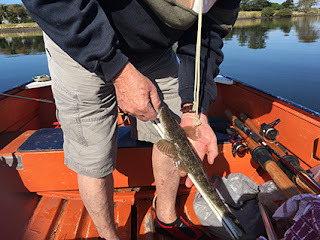 As well as the Giant Toadfish, Dad and I caught some more identifiable and useful fish in the river a couple of weeks ago. Flathead are one of my favourite fish to catch because they give you a good fight when you're pulling them in. 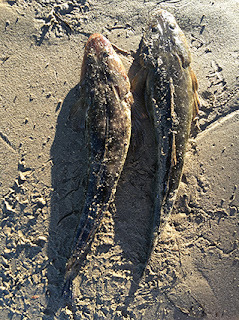 Here are some of the flathead we caught. In NSW, flathead have size restrictions, so here's Dad with his trusty measuring stick checking the size of the fish I caught. There are different types of flathead - we caught Dusky Flathead. Duskies have to be over 36 cm, and if it's over 70 cm, you may only keep one. Bag limit is 10 fish. 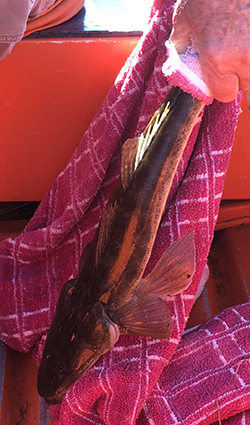 If the flathead was a bluespotted or tiger, then they only need to be 33 cm long to be potable. Still a bag limit of 10. If you're interested in NSW saltwater fish limits, the DPI has them here. To fish in NSW, you also require a fishing license, unless you're a child or a senior. 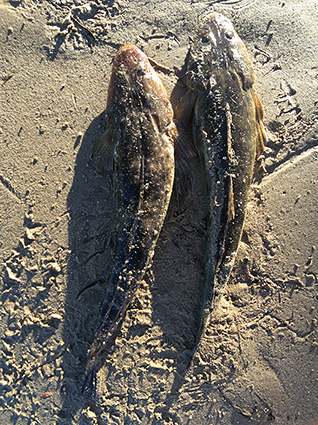 Dusky Flathead are found in estuaries and bays, and can be found over sand, weed, silt, mud, gravel. They often vary in colour depending on habitat. And they have wicked spines, so be careful handling them. It's not just the obvious spines down the midline of the front and back, but at the sides of their head, there's kind of a tip of bone, and there are wickedly sharp, pointy spines there too that hurt like blazes if they catch you. 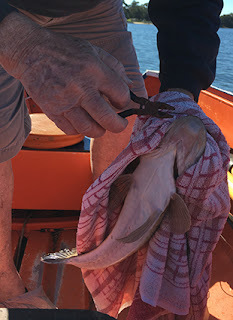 Dad told me that if the spines get you, you should rub the underbelly across the wound to stop it hurting - not sure if that works because the fish that spiked him as he was releasing it, jumped out of the net a little too soon for first aid to occur. I'm not a huge fan of eating flathead - mostly because of the bones. But flathead tails are exquisite and they don't have so many bones.